I always enjoy expanding my sewing horizons by taking on new challenges. 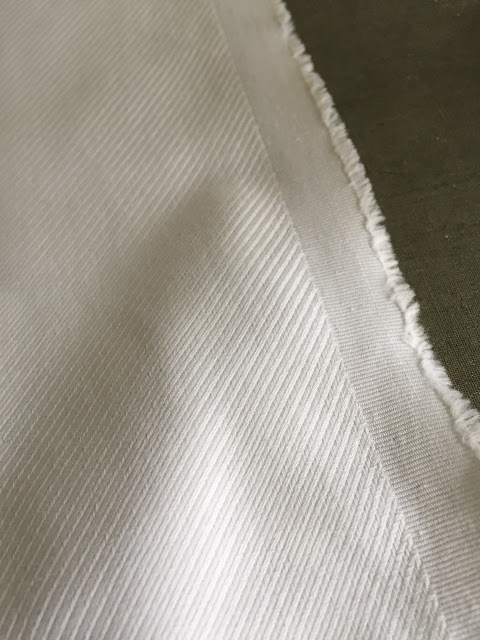 My latest shirt, a client project, is bright white and, hence, must be kept pristine, and it's a heavy cotton twill shirting with a very visible diagonal weave, which presented some fun design opportunities. When I'm starting a white or very light-color project, my first step is always to clean my sewing space and the surface of my machines. 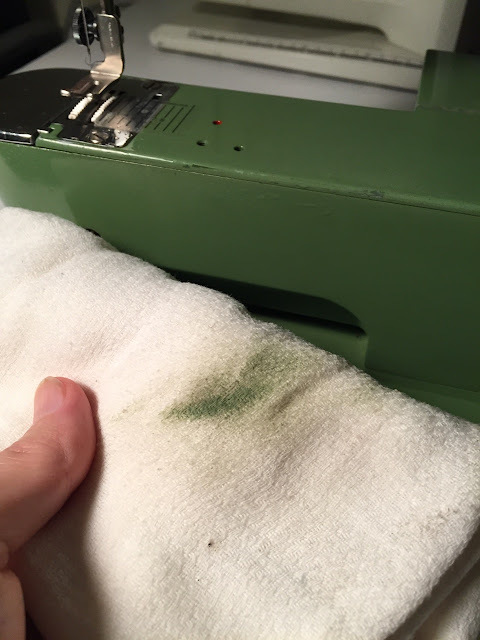 I learned this week that I should not clean my Elna Grasshopper (the machine I use almost exclusively these days to make shirts) with isopropyl alcohol -- eek! Fortunately I noticed my error before I did too much damage. Mild soap and water from now on. The shirt itself has come together smoothly. To add some visual interest, I split the back yoke so that the diagonals meet at the center yoke seam. I've never done that before. I usually don't wear so formal a fabric but I think I'd like a white cotton twill shirt myself! 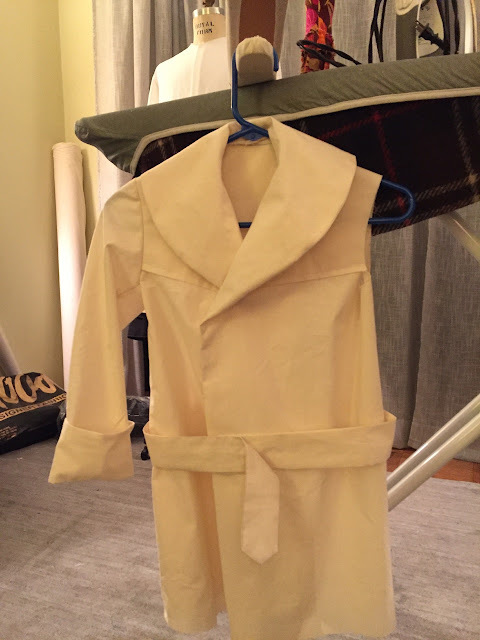 Meanwhile, my 1920's Size 8 mackinaw coat pattern arrived during the week and I've whipped up a muslin just for fun. While the envelope is rather crumbly, the pattern itself is in amazingly good shape: you'd never guess it is almost ninety years old. The muslin isn't entirely done but I think you get the idea. Now to find an eight-year-old! Oh -- and one more vintage pattern arrived in the mail today. There's much more sewing ahead -- and a whole lot of neoprene to conquer -- perhaps even before Thanksgiving. Alcohol will destroy your clear coat and decals. Water (even vapor) rusts (even non-exposed metal) and soap residue over time will also break down clear coats and shellac and attracts dust and dirt. Your best bet is sewing machine oil. To polish and protect brightwork, I use Maas metal polish on polished nickel and chrome, Brasso on matte steel. I use TR-3 on paint. Mouse, you're the Heloise of the sewing world! The twill shirt looks so sharp! And that yoke is gorgeous! Fantastic coat pattern. Have you thought about taking it to a printing shop and having them enlarge it for you? I love the white twill shirt. you should make one for yourself. The shirt is coming along beautifully. 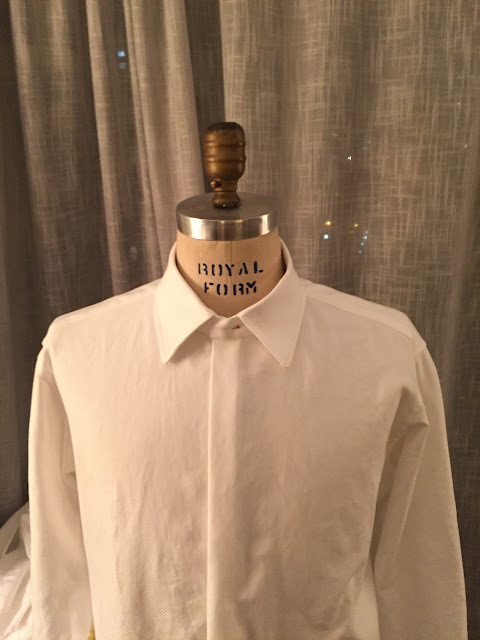 A white shirt is always such a classic garment so you should definitely make one for yourself. Strategy for drafting your Mackinaw Jacket pattern. Using one of your proven jacket patterns, modify the neckline for a shawl collar. I'm sure you have a few drafting book for reference. My go-to reference is Kawashima's "Fundamentals of Men's Fashion Design" for anything tailored, pants or jackets. 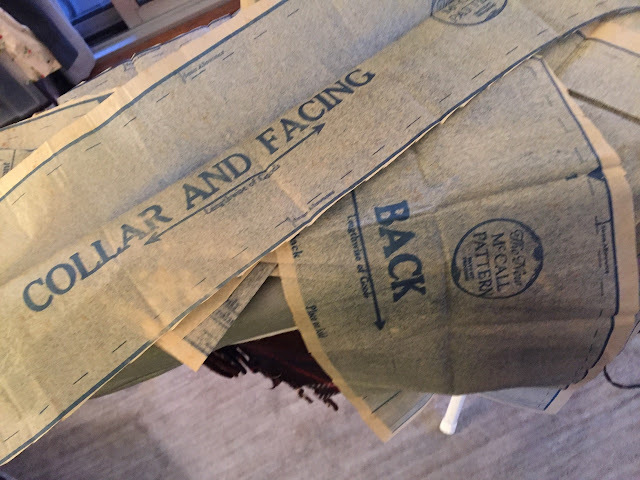 The crucial step in making a nicely finished shawl collar is to get it to lie smoothly over the shoulders and back. 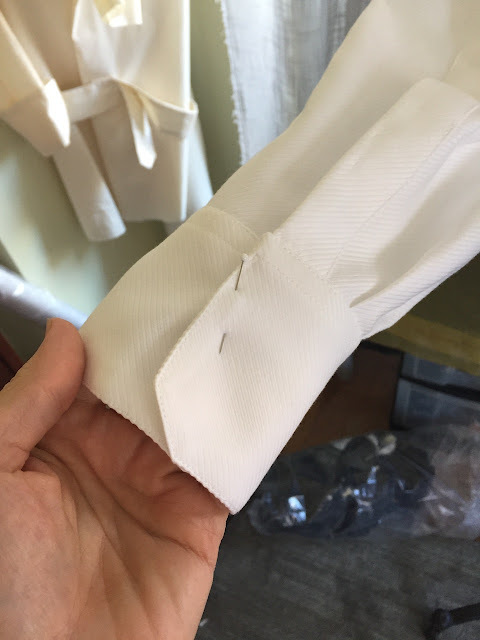 You could drape it on a form, but I just make my best draft, cut and sew a fitting muslin. 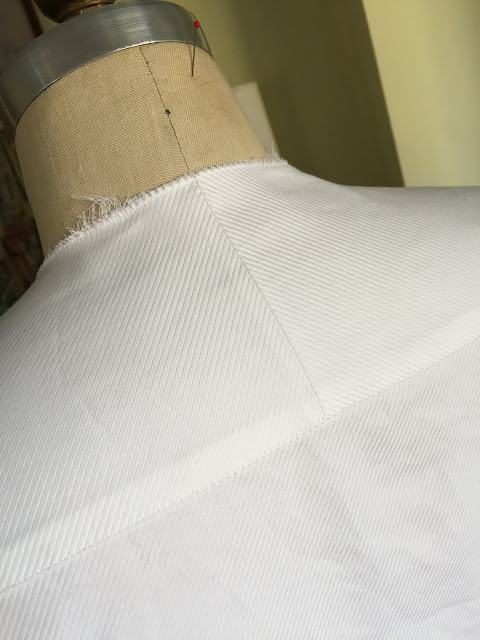 The collar is usually ill fitting and a few well placed slashes will make it lie flat over all the curves. Tape the slashed spaces securely and use the muslin to make the paper alterations. After that, add the requisite details to the rest of the jacket. Hope this helps. Piping: Kenneth King is the guru of piping, I think Cool Couture is the book full of the instructions. I tested Closet Case's pajamas, and if I didn't know piping before, I surely do now. You want dapper? Liberty print piping on cream. Don't forget to put a line in the cuffs. If you are ever up for adoption I get first dibs! Peter, that white twill shirt is going to be immaculate. Love how you did the diagonal weave on the shirt yoke. 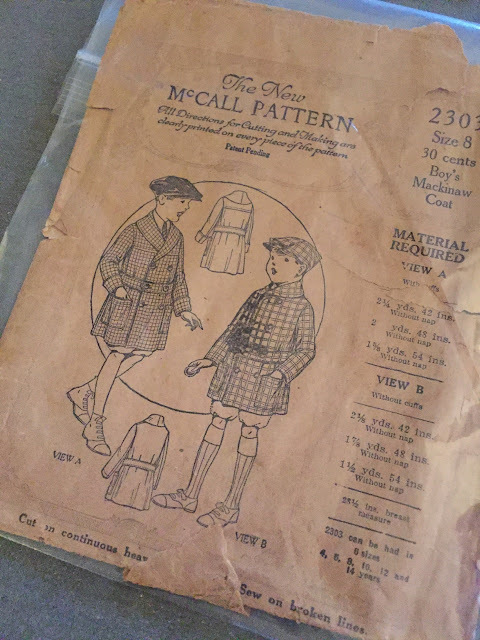 The vintage patterns are interesting, too, especially the little Mackinaw coat. Piping is SO easy -- go on and try it! It's the really thick covered cords that cause grief, like the 1/2" or 3/4" cords that sometimes go in seam on duvet covers or at the bottom edge of round table cloths. With those jumbo cords, you get one layer of fabric feeding faster than the other and it wants to wrinkle and twist. With 1/4" cord or smaller, that doesn't happen. Skinny little piping like you'd use on your pajamas will go in as easy as pie. As easy as pie made by a baker, that is -- pie made by ME involves lots of swearing and comes out looking like a mess! You probably have a special foot for one of your machines that would make the piping even easier. 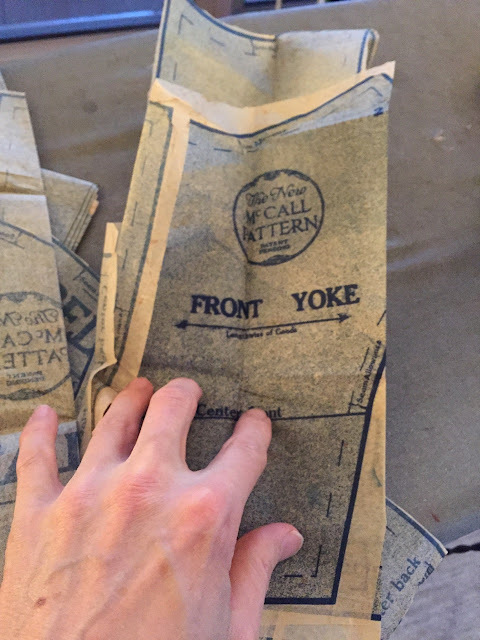 I look forward to seeing these vintage patterns as you sew them up -- I've learned so much from your blog! As for finding an 8-year-old -- aren't kids bigger today than they were in the 1920s? Maybe today's 6-year-old would be a better match for your pattern? 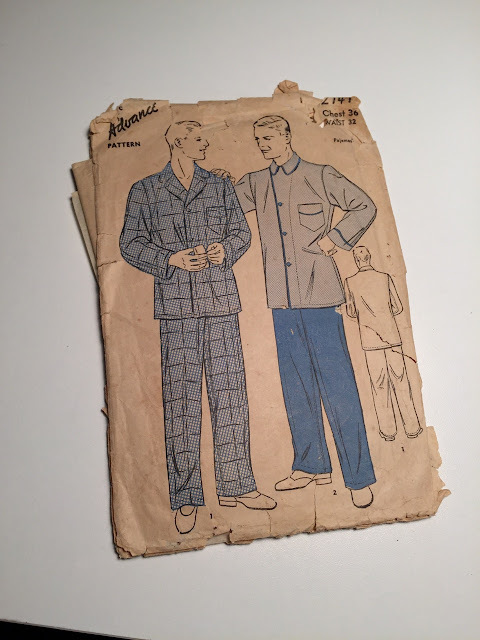 I made pajamas with piping and they remind me of what actors wore in movies and TV shows in the 50s and 60s. I love to pipe! It's an essential of home dec seeing. Very easy with zipper foot to follow the rim of your pipe. I always baste first. The mini me mackinaw looks promising. I have a child size manniquin I'd loan you if I was geographically accessible. You can make it stand there and stick pins in it and it doesn't squirm. Say?! Don't you have a big doll lurking somewhere to use? Love that shirt. It begs for a top hat and tails somehow. Even a cane. Happy Thanksgiving. I'm so grateful for MPB!!! I recently tried piping, and it's not too terrible. It did take me practice to get the timing down between both hands and presser foot. I never got it as perfect as I wanted though. I LOVE that twill yoke. That is beautiful. Working on white is a nuisance, but will be so worth it! I used to do bridal and would make my brides come for a fitting without makeup or wash it off when they arrived! Don't forget to wash up before touching it!!! OOOHHH! Men's jammies...wish I had a pair So comfy. And piping on jammies can be done without using any filler cord....just add a strip of contrasting fabric into the seams. I really like the shirt! Have you also wanted to be able to buy identical twill fabric that has the pattern mirrored? Or am I the only one with a OCD in this way? Revisiting Metallics: Silver Denim Jeans! Peter Models the Silver Metallic Jeans! MPB Exclusive: KENNETH KING GIVEAWAY!